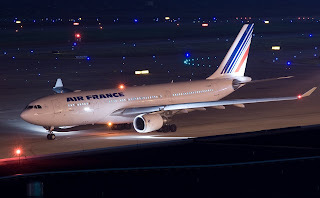 1 June 2009; Air France A330-200; Atlantic Ocean:: The aircraft was on a scheduled international flight from Rio de Janeiro, Brazil to Paris, France. The aircraft crashed in the Atlantic Ocean in an area roughly 390 miles (650 kilometers) northeast of Brazil's Fernando de Noronha islands, which are about 220 miles (354 kilometers) off the northeast coast of Brazil. Debris from the aircraft was found near the estimated position of its last radio communication. All 216 passengers and 12 crew members, together representing over 32 nationalities, are missing and presumed dead. Brazilian military aircraft have spotted several areas of suspected debris, and ships from Brazil and elsewhere are converging on these areas to recover any floating debris and the bodies of any crash victims. What isn't yet known is the location of any wreckage, including either of the black boxes (cockpit voice recorder and flight data recorder). Each recorder is equipped with an underwater locator beacon, also called a "pinger," which is activated when the recorder is immersed in water. It transmits an acoustical signal that can be detected with a special receiver at depths of up to 14,000 feet (over four kilometers). The investigation is headed by the French Bureau d'Enquêtes et d'Analyses (BEA), the equivalent of the NTSB in the US or the AAIB in the UK, and the BEA will be assisted by a variety of other nations, including Brazil and the US. So far, the most direct evidence of the cause of the accident is the presence of aircraft debris on the ocean surface and a series of automatically generated maintenance messages that were transmitted from the plane shortly before the crash. According to Air France officials, these messages indicated that there were several problems with the aircraft, including some unspecified problems with the electrical system and cabin pressurization system. While there were severe thunderstorms in the area of the crash, and some suspicion that the aircraft was hit by lightning or encountered severe turbulence, there is no direct indication that this occurred. The presence of the debris field on the ocean surface also does not imply that the aircraft broke up in flight. AirSafe.com will update crash information as it becomes available. I think ,it's about time to install a VCR (Video cockpit Recorder ).I am writing a proposal about this concept and will dispatch it to all concerned aviation related institutiions.The VCR is simply a live video broadcasting system that could bradcast live the flight deck !3 cameras(one focussed on the captain,one on the first officer and one on the flaight pannel).The video data will be sent live to the flight operation center and be recorded .That way if trouble occurs,the expert will have some visual info handy to start investiguating.We wont have to wait that long to find the black box(if we find it) to see what actions the crews have taken!